In this post, I will present my personal “Team of the season” from the recently finished GLO Premier League 2010-2011 in Ghana. The players are picked based on the matches I have seen, as well as articles I’ve read and reports from contacts in the scouting business. Sowah has been a very consistent performer for the league champions and also forced his way into the squad of the Ghana national football team during the season. Football experts in Ghana thinks Sowah has a fair chance of taking over Ghana’s number one shirt when Richard Kingson hangs up his gloves. Sowah is not the tallest of goalkeepers but he is very agile and commands the defenders very well. He is also an excellent shot-stopper. Sowah is a former player of Tema Youth FC that joined Berekum Chelsea before the 2009-2010 season. Still only 23, he should be considered as a rather young goalkeeper with a bright future ahead of him. Also considered: Fatau Dauda (AshantiGold SC), Joseph Addo (Heart of Lions FC), Collins Addo (New Edubiase United FC), Stephen Adams (Aduana Stars FC). I was very unsure about this pick but Boakye has impressed me in several matches this season. Boakye is a versatile defender who can also play as a central defender or right-back but based on the great form of right-back Henri Traoré and central defenders John Ashong and Henry Entsir, Boakye has played a lot of matches at left-back. AshantiGold SC had the best defence in the league, conceding only 14 goals during 30 matches. Boakye is a very attacking minded defender who sometimes almost looks like a winger with his hard-running. He has good technique and great control of the ball. Boakye played for Asante Kotoko FC in 2009-2010 but failed to break through at the top club. He is a former player of Gamba All Blacks FC. Boakye was recently added to the squad of the Ghana U-23 national football team. Also considered: Alfred Arthur (Berekum Chelsea) and Francis Larbi (Aduana Stars FC). Frimpong joined Asante Kotoko FC in January 2011 and has therefore only played the second half of the season. Nevertheless, I have picked Frimpong as the best right-back in the GLO Premier League 2010-2011. Frimpong played all 15 league matches since joining Kotoko from the Ivorian powerhouse ASEC Mimosas and has proven to be an excellent acquisition to the team. Frimpong is a rather small player, apparently 167 centimeters and 61 kilos. He is a attacking-minded, modern-style full-back who is very energetic, hard-working and skillful. Frimpong played 15 of 26 matches for ASEC Mimosas in the 2010 Ivorian Ligue 1 and scored one goal. Frimpong was part of the Feyenoord Academy in 2006-2007 and 2007-2008 and was member of Ghana U-20 during 2007 and Ghana U-23 during 2006. Also considered: Henri Traoré (AshantiGold SC), Akwasi Bobie Ansah (Hearts of Oak SC), Eric Agyemang (Berekum Chelsea), Amos Frimpong (BA Stars FC). AshantiGold SC conceded only 14 goals in 30 matches and the defensive general of the side, John Ashong, deserves a lot of the credit. Ashong is truly a brilliant central defender; calm and explosive at the same time, strong and hard-tackling. Ashong has been a key member of the Ghana B national football team in 2010 and 2011. He was picked for the CHAN tournament in Sudan and was one of few players that impressed. Ashong is a former player of Hasaacas FC and joined AshantiGold SC before the 2009-2010 season. There seem to be some confusing regarding the age of Ashong. When the official Hasaacas FC 2008-2009 squad lists were published at http://ghanafa.org, Ashong’s date of birth was given to 02.11.1981. However, when the Ghana B squad was published at http://cafonline.com/ before the CHAN tournament in 2011, Ashong’s date of birth was given to 02.11.1990. Ashong was recently linked to top club Kaizer Chiefs FC from South Africa. Also considered: Kweku Andoh (Heart of Lions FC), Rashid Sumaila (Ebusua Dwarfs), Alfred Nelson (Liberty Professionals FC). I personally think Awal has been the best central defender in the GLO Premier League 2010-2011. Awal joined Asante Kotoko FC from ASEC Mimosas in January 2011 (together with Yaw Frimpong) and immediately established himself in the heart of the Kotoko defence, playing the last 15 matches of the season. Awal is a strong, hard-tackling central defender, apparently about 185 centimeters. He is surprisingly elegant for such a powerful man. Awal has received a lot of praise during the season, and was also picked for the Ghana B national football team for the CHAN tournament in Sudan. Awal joined ASEC Mimosas from the Ivory Coast during the second half of the 2010-season, signing from Feyenoord Academy where he had been a consistent performer in 2008-2009 and 2009-2010, both seasons at second level in the Ghana football pyramid. Awal played four matches for ASEC in 2010 and failed to establish himself at the Ivorian top club. He was part of Ghana U-20 during 2007 and was a member of Ghana B national football team as early as 2008. Also considered: Edward Kpodo (Berekum Chelsea), Emmanuel Akuoko (Aduana Stars FC). Akowuah is a defensive midfielder who is strong in the tackle and fiercely competitive on the ball. Akowuah is physically strong and despite focusing on defensive responsibilities, he also has the eye for the good attacking pass. Akowuah is a former player of King Faisal Babes but broke through in 2009-2010 when he was one of the star performers of Great Olympics from Accra. Akowuah was part of the Ghana B national football team in 2010 and was recently added to the squad of the Ghana U-23 national football team. Also considered: Yaw Alexander (Berekum Chelsea), Jackson Owusu (Berekum Chelsea), Samuel Asiedu (Aduana Stars FC), Daniel Nii Adjei (Asante Kotoko FC), Sheriff Danladi (Heart of Lions FC). 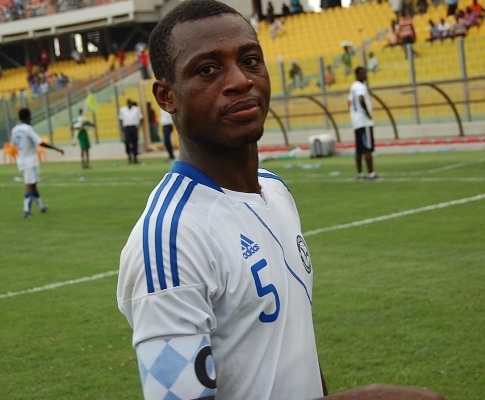 Basit is the playmaker and the regular captain of the champions Berekum Chelsea. The 25-year old has had a wonderful season and his accurate passes and intelligent work behind the Chelsea-attackers Emmanuel Clottey, Emmanuel Osei Banahene, Bismark Idan and Obed Owusu was fundamental to his team’s success. Basit is very confident with the ball and combines creativity with hard work and leadership. He scored five league goals during the season and was a regular member of the Ghana B national football team, including apparences in the CHAN tournament in Sudan. Basit joined Berekum Chelsea FC before the 2008-2009 season, having played the previous season at Accra-based Great Olympics. The picture is of Basit and is taken from Ghanasoccernet. Also considered: Michael Helegbe (Liberty Professionals FC), Bright Nsiah (Heart of Lions FC), Frank Nortey Sowah (Wa All Stars FC), Frank Sarfo Gyamfi (Wa All Stars FC). Amoah has been one of the revelations of the GLO Premier League 2010-2011. Amoah is still only 17 years of age but is arguably the star player at struggling newcomers Mighty Jets FC. Amoah was also the top goalscorer of the club with six league goals. Amoah is a rather small midfielder, 171 centimeters and about 65 kilos. He is a versatile midfielder who can play as a holding midfielder but is mostly used as an attacking midfielder at his current club. He has even played some matches as a striker. The teenage prodigy made his mark in Ghanaian football in 2008-2009, playing for Mighty Jets FC in the Division One League – the second level of football in Ghana. His start of the season was impressive and he was soon to be named in the squads of Ghana U-17, being an important member of the team that failed to qualify for the CAN U-17 being played in Algeria in March / April 2009. In August 2009, Amoah was named in the squad of the Black Starlets, the U-20 national team of Ghana. Although disappointed for missing out on the CAN U-17, Amoah was in December 2009 named as the best young player of Ghana following his exploits for the U-17 team. A major achievement for such a young player, only 16 years of age when he received the award. Mighty Jets FC did not win promotion after the 2008-2009 season but Amoah decided to join one of the teams that actually did, New Edubiase United FC. The 2009-2010 proved to be a difficult season for New Edubiase, struggling with relegation-worries most parts of the season. However, Aaron Amoah was a bright spot, providing an important platform behind their quality strikers Fuseini Nuhu and revelation Seidu Bansi. During the season, he was a regular member of the Black Starlets. Also considered: Gladson Awako (Heart of Lions FC), Alhaji Sani (AshantiGold SC), Michael Amissah Insaidoo (Ebusua Dwarfs). I am pretty sure that almost every fan of Hearts of Oak SC, traditionally one of the top clubs in Ghana, will agree that Douglas Nkrumah was the best player of the Phobians during the GLO Premier League 2010-2011. Some would even claim that the club could have been facing relegation without the performances of Nkrumah. Nkrumah scored 12 goals during the season, making him the top goalscorer in a very dissapointing season for Hearts of Oak SC. The biggest problem of the club seemed to be finding a free-scoring striker and when Edwin Osei Pele, Mahatma Osumanu Otoo, Uriah Asante and Wilson Andoh, all failed to scored regularly, the deep-lying playmaker / winger Nkrumah stepped up. Nkrumah is a former player of the Ghana B, Ghana U-23, Ghana U-20 and Ghana U-17 national football team and I personally find it strange that this creative and skillful player is not part of the current Ghana B national football team. Nkrumah is a former player of Kessben FC and Asante Kotoko FC. Also considered: Bernard Dong Bortey (Aduana Stars FC), Obed Owusu (Berekum Chelsea), Bismark Asiedu (Ebusua Dwarfs). Clottey scored 15 goals during the GLO Premier League 2010-2011 and from my point of view, he is the best striker in the league. Clottey also forced his way into the squad of the Ghana national football team during the season. Clottey made his mark at Great Olympics between 2006 and 2007. He then had a stint at Austrian club FC Wacker Innsbruck in 2007-2008. In 2008-2009, Clottey joined OB Odense from Denmark but failed to make any appearances. He returned to Tema Youth FC and signed for the ambitious Berekum Chelsea FC before the current season. Clottey is a burly, mobile striker who always seems to be on the run. He is also a clinical finisher and shoots well from any angel. Also considered: Nana Poku (Berekum Arsenal), Abdul Wahab (King Faisal Babes), Fuseini Nuhu (New Edubiase United FC). Also considered: Nathaniel Asamoah (Asante Kotoko FC), Daniel Larbi Coomson (Medeama SC). I replied to your mail a few days back – please check it out.